Makenzies Miracle: We Play So Hard Together! We Play So Hard Together! Here is a picture of three of my therapists with us in CA on the beach! My mommy has worked very hard to get me lots of therapy! I have Physical Therapy (PT) five times a week, Occupational Therapy (OT) 4 times a week, and Feeding Therapy two times a month. I have not had Speech in a while but I am going to start getting it a gain soon. All but two of these therapies happen at my house. Mommy set up a therapy room at our house with all of the therapy tools needed to have therapy in my most comfortable enviornment...my home! I have three PT's that love me very much! We love to play on the ball. 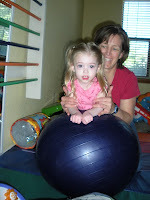 On the ball I learn how to put my head in the middle and hold it there while bouncing. Also how to push up to sit, and it helps stretch my body so I am not so flexed! We also play a lot on the bolster. This helps me keep my legs apart in sitting and builds strength in my trunk, arms, and shoulders when I push against it. My wall ladder allows me to hold on and stand up. I can also practice sit to stand. We also do a ton of stretching to keep my body moving and working. My OT (who also loves me to the moon and back) works on my arms and hands! We play puzzles together and practice picking up the pieces! 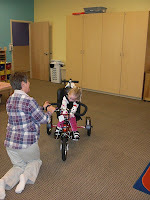 She gets to teach me how to hold onto and let go of toys and move my arms more freely. She is very good at streching my hands, arms, and shoulders. We also play on the ball and bolster. Sometimes mt PT and OT come at the same time so that they can work together with me. In Feeding Therapy we work on eating. We use lots of tools to desensitize my mouth because I don't really like to have food in my mouth. I can swallow and protect my airway. I took a test at the hospital to make sure I wasn't getting food in my lungs and I passed! So I can eat small bits of food. I am working on learning how to chew and move my tongue. I do a great job but can not eat enough through my mouth to grow.